Today was my second day back at training after I took a ten day break due to Flu. At first I thought it was just some cold but before I knew it I was on Antibiotics and in no state to train. Yesterday was an easy 2100m swim session, with the main set 7x300m, just to get back into things. One thing I found when I swim is I can easily feel if the lungs are in good shape or not. Maybe it's the controlled breathing that make you more attend, don't know. Today I did a 45 minute bike ride, also easy just to get back in the groove. This evening's run session I upped the pace a bit but still kept it short and did 5.3km in 23minutes. Happy that I could maintain round about a 4:35min/km pace, since I haven't done a lot of running lately. 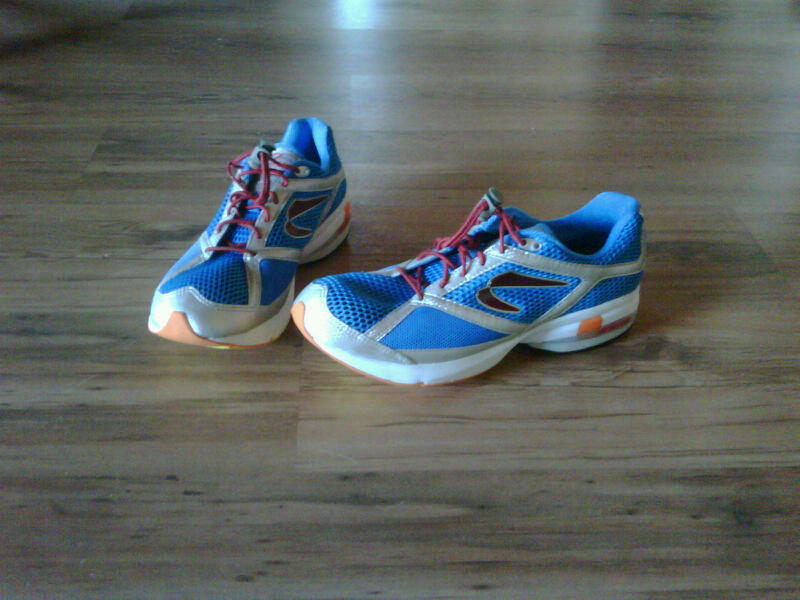 Nothing like running with a new pair of shoes! Bought the Newtons some weeks ago but waited for the green light to run before I pulled them out of the closet. Today was my final check up at the specialist after the knee surgery and he is very happy with the strength and the flexibility of the knee. He gave me the go ahead to run but reminded me to plan my running sessions carefully as the knee had it's fair share of cartilage removals. Amazing how strong the mind is. Before I picked up flu I was running at 5+min/km and was scared to go too fast in case something happen to the knee. This evening I run almost at 4:30 pace without any discomfort and not even thinking about the knee-"cause doc said the knee is fine"
One thing about running and don't think anybody can argue is you loose weight went running even if your eating habits aren't that great. During the past couple of weeks I've gained some weight and although I cycled and swim, the scale just moved in the wrong direction. Hopefully now that I'm back at running the weight will move to the opposite direction. I've also embarked on a new experiment to improve my weight and eating habits. Don't know how long it will last but I like trying out new things. It's only the second day and today was much better than yesterday. I've read a lot about the Paleo way of eating and am giving it a try. No grains, dairy products, sugar or any processed foods and refined sugar. The eating plan consist of lean meats, fish, veggies and fruit and that's it! Amazingly I have more energy than I though I would have if I don't eat any bread, oats and all those things. At this stage I don't think it is something I will do for the rest of my life but they claim that you will have just as much energy as when you eat grains and you will loose weight real quick. Well after two days I've lost one kilogram, just another seven to go! Max, Kim's cat getting really old now and all he do is sleep. Think he is 16 years old! Great job! I agree with your statement about the swim being a great test for the lungs. I know if I am in shape or not based on how I feel in the pool (breathing wise). Fingers crossed with your knee man. I am hoping you make it back strong and healthy. Wow thats so awesome that you're already back at it! I look forward to hearing about the progress! J, glad to hear your feeling better. I can't believe you took so much time off and even with the knee problem your run time is amazing. I can't figure it out, but I'm happy for you. Good luck on the diet, I'm curious to see how it goes. just listened to that Bobby Mcgee podcast talk (finally) I'm going to start practicing the run / walk protocol starting now and I plan to use it on the marathon this summer.....thanks!